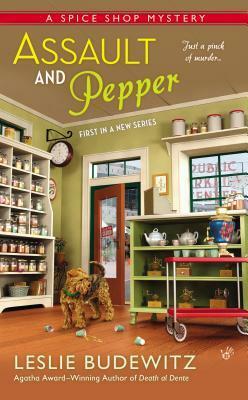 Just finished this new cozy mystery, Assault and Pepper, A Spice Shop Mystery by Leslie Budewitz, who also writes the Food Lovers’ Series. I enjoyed this mystery particularly for the sense of place that is developed. The setting is Seattle and the book is “peppered” with references to Seattle landmarks and lifestyle references. The main character, Pepper, is interesting and intelligent and there is a rather large cast of characters, the staff of the spice shop, Pepper’s girlfriends, and the local homeless community. Pepper has a couple of love interests but not in the sense of the love triangle common to cozy mysteries. Pepper gets involved in a murder investigation because she discovers the body on her shop’s doorstep and then one of her employees is arrested. Pepper makes it her mission to clear Tory’s name irritating her ex-husband, a local policeman, and putting herself in danger. I will be reading more of this series as they become available! Just discovered your kind words — many thanks! Psst—GUILTY AS CINNAMON will be out Dec 1! Thanks – I have it added to my TBR list!